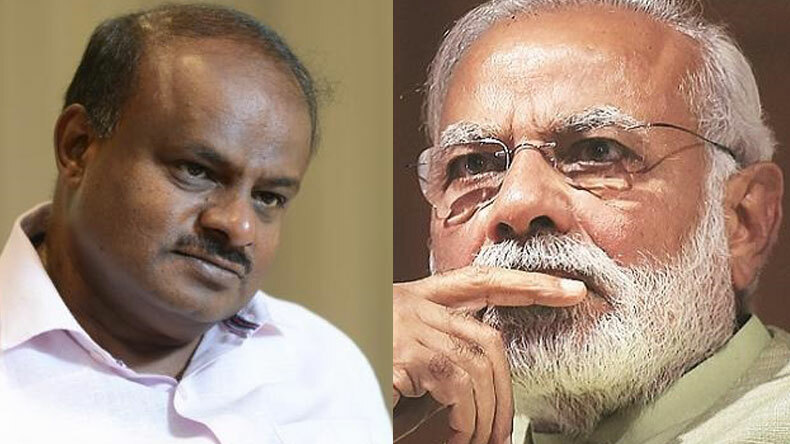 Prime Minister Narendra Modi on Wednesday congratulated HD Kumaraswamy and G Parameshwara for taking oath as Chief Minister and Deputy Chief Minister of Karnataka. The oath-taking ceremony took place in the presence of many regional and opposition party leaders including Congress veteran Sonia Gandhi, party president Rahul Gandhi, Andhra Pradesh CM Chandrababu Naidu, BSP chief Mayawati, SP chief Akhilesh Yadav, CPM's Sitaram Yechury, Delhi CM Akhilesh Yadav and others. Prime Minister Narendra Modi on Wednesday spoke to JDS leader HD Kumaraswamy and congratulated him for taking oath as Karnataka Chief Minister. The Prime Minister also congratulated G Parameshwara for swearing-in as Karnataka’s Deputy Chief Minister. The oath-taking ceremony was a grand event organised by the Congress-JDS alliance completely aimed to showcase opposition’s unity across the nation and up the ante against PM Modi led BJP. Though HD Kumaraswamy and Parameshwara took the oath of the office, the floor test will be held tomorrow. JDS leader Kumaraswamy had invited all regional and opposition party leaders for his swearing-in ceremony to display opposition unity against the Modi government at the Centre and also to convey a message for 2019 General Elections. To grace the occasion, Congress veteran Sonia Gandhi, party president Rahul Gandhi, Andhra Pradesh CM Chandrababu Naidu, BSP chief Mayawati, SP chief Akhilesh Yadav, CPM’s Sitaram Yechury, Delhi CM Akhilesh Yadav and others. This has been for the first time when Karnataka had witnessed three chief ministers in a month. Outgoing Siddaramaiah, Yeddyurappa who had to resign after BJP failed to prove the majority on the floor of the House and now Kumaraswamy who has taken the oath of the office today and will face the floor test on Thursday. “This coalition government (Congress-JDS) will run better than any-one party government and we will concentrate on working for the public. We have decided to work together for the betterment of the state,” Kumaraswamy added. He also said that he will waive-off farmers loan.